We are still debating baby names for our little girl, but had an unique and interesting suggestion come in over the weekend: Paisley. My husband became instantly attached to the name, and while I'm still not 100% sold, I can't help but think of how cute it would be to dress her in preppy paisley prints. 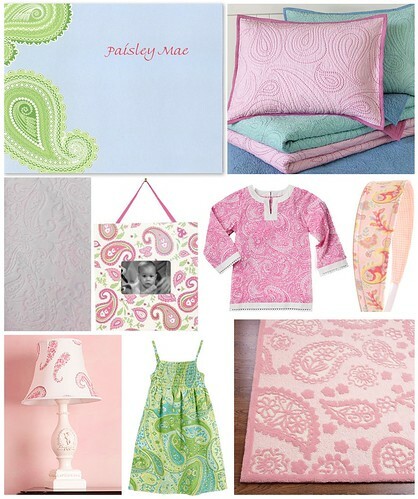 I just adore the paisley pattern when used with bright cheery colors like aqua, kelly green and pink-- especially for the summer time! The paisley pattern has been used to symbolize life, love, royalty and eternity throughout the generations and has also been used as a symbol of holiness and aesthetic beauty-- how is that for a name meaning?